In the words of the famous Cornish philosopher Jethro, ‘now before we start‘, if you look on the Ordnance Survey map at grid reference SX 62155 82471 you will find ‘Statt’s House’. That in itself is fairly unique because look in almost any respected book about Dartmoor and you won’t find it, but you will find ‘Stat’s House’. This well known ‘residence’ has over the centuries become a familiar landmark for those travelling across the dome comprising of Kit Hill, Stat’s House Hill and Maish Hill (now marked on the OS map as Winney’s Down). In fact the tracks leading to Stat’s House are now that well defined that they can be seen on Google Earth from an altitude of 10,915ft. So what is Stat’s House? Today Stat’s House is but a small ruin whose walls stand to about 1m high, which in Dartmoor terms is not bad. The only purpose it serves is a meagre shelter in bad weather and a handy lunch-stop fro hungry ramblers. Also over the years it has been the subject of many letterboxes and in the early days a site for such. Hemery, (1983, p.494) relates how up to 1960 the door lintel was still in place along with the visible fireplace and cupboard recess. The house has at some point in time given its name to the very hill upon which it stands – Stat’s House Hill. English Heritage simply classify the structure as a ‘shelter’ dating to the post medieval period which would date it to between 1540 and 1901. Butler, (1991, p.154) suggests that the actual stone used to build the ‘house’ was probably taken from the old cairn with which it shares the hilltop. About 60m to the north-west of the house lies the entrance to a peat pass also known as Stat’s House cut and here lies a clue to the house’s purpose. As can be seen from the map below, Stat’s House is virtually surrounded on all sides by water which is also a good indicator for marsh and mire, these in turn eventually result in peat formations. It was the ‘Black Stuff’ that brought men onto the hill and as can be seen from the aerial photograph this is a wild and desolate place with civilisation miles away. Therefore when these peat cutters went to work it meant a long trek which would have been exhausting if travelled each day. So the simple answer was to build a house and live up on the moor whilst cutting and drying the peat. Not only did these simple abodes act as a temporary homes they also served as a storehouse for tools and a shelter from the onslaught of the Dartmoor storms. Nobody knows exactly when, but sometime in the past, a peat cutter called ‘Stat’ came up on the hill to cut peat and build his shelter which later became known as ‘Stat’s House’. ‘The structure is sub-rectangular, with a rounded N end, and measures 3.6m N-S and 2m E-W. The walls, of coursed moorstone blocks, are 0.8m wide and stand up to 1m high on average. At the S end is a fireplace and here the wall survives up to 1.7m high. The interior is paved with granite slabs and an entrance lies in the E wall, close to the SE corner. There is evidence of peat cutting in the area, and the building was most likely used for shelter and storage by the peat cutters,’, (Riley, 1994, on-line source). Anybody visiting Stat’s House today can see what stunning views are afforded from this hilltop abode which I am sure would have been an added bonus to it’s location. Remote and as bleak as it is, money today could not but such an aspect with the added bonus of very few neighbours, a whole host of water supplies and good, clean Dartmoor air. Although whether contiguous or not, there is another peat cutters hut about 300 metres away and three tinner’s huts about a kilometre distant so perhaps that would have been some company for Mr. Stat? Butler, J. 1991. 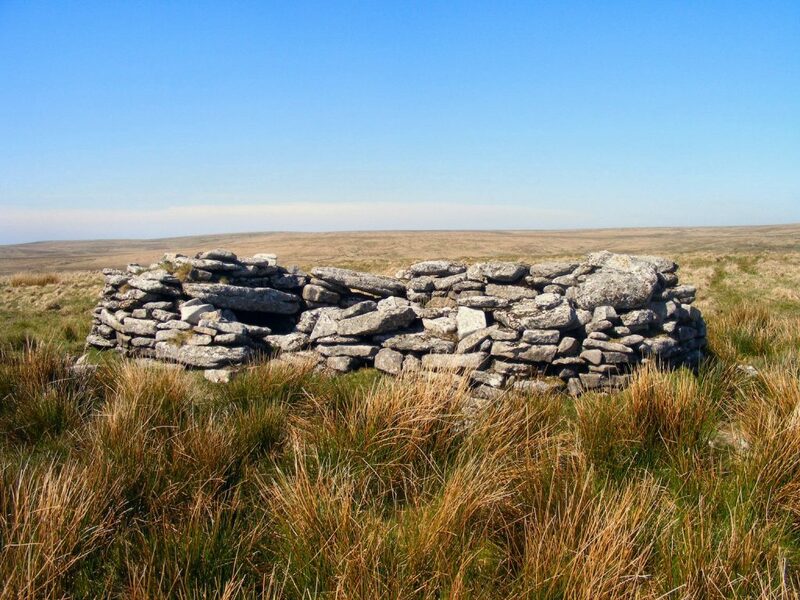 Dartmoor Atlas of Antiquities – Vol. II, Exeter: Devon Books. Hemery, E. 1983. High Dartmoor, London: Hale Publishing.